Prior Scientific’s Z-Deck range is a height adjustable platform designed specifically for upright microscopes widely used in electrophysiology and neuroscience, including the Nikon FN1/Ni, the Olympus BX51WI/BX61WI, and the Zeiss Axio Examiner microscopes. 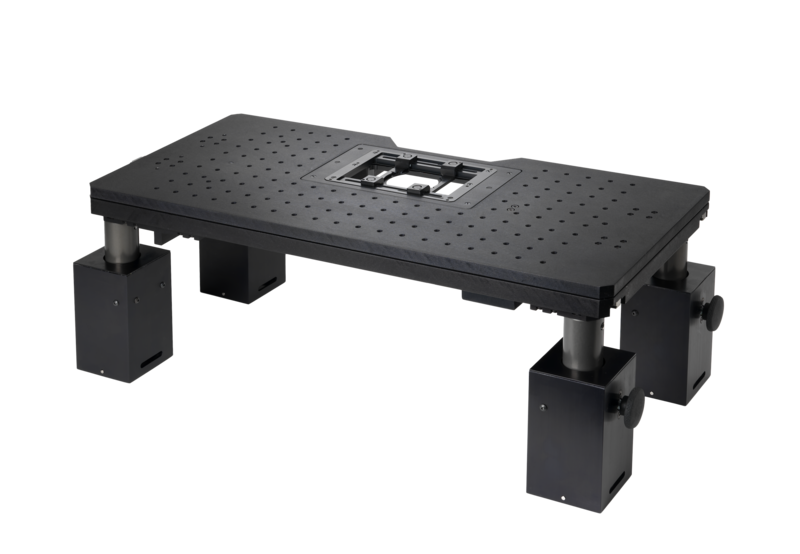 Compatible with most commercially available vibration isolation tables, the Z-Deck offers an exceptionally stable platform ensuring that your experimental area is as smooth and vibration free as possible. The Z-Deck large top plate provides an extensive surface area enabling users to undertake a comprehensive range of tasks and enough space to set up even the most complex experiments, which may involve environmentally controlled chambers, micromanipulators and other instruments. The Z Deck’s top surface breadboard design (6mm holes on 25mm centres) is ideal for accurately and quickly mounting equipment. The Z-Deck is equipped with pneumatic piston towers which allow effortless lowering and raising of the platform, without the use of tools. Offering the ability to switch between imaging heights within seconds the Z-Deck is well suited for observation of both thin sample and whole animal imaging. The Z-Deck is fully compatible with Prior’s range of inserts, including the NanoScanZ, designed to provide exceptionally fine movement in the Z-Axis. This deck configuration facilitates Köhler illumination at a range of imaging heights. To meet the differing requirements of scientists Prior produce a variety of Z-Decks – motorised, manual and fixed. For applications demanding exceptionally precise movements in the X and Y axes the motorised Z-Deck with sub-micron resolution and Prior’s patented IST technology provides unmatched accuracy and repeatability. Adding 50nm linear encoders to the Z-Deck stage increases stage precision, required for high magnification imaging applications. The ProScan III controls the Z-Deck stage and other Prior equipment and can be easily integrated into most imaging software. In applications where electrical noise might be an issue, the power to the motors of the motorised Z-Deck can be switched off after movement. The manual Z-Deck can be finely controlled in its XY movement without the presence of any electrical motors whilst otherwise retaining all the advantages of the conventional Z-Deck. If you do not require XY movement from your stage at all, the Fixed Z Deck provides a robust, stable, and rapidly height adjustable platform.